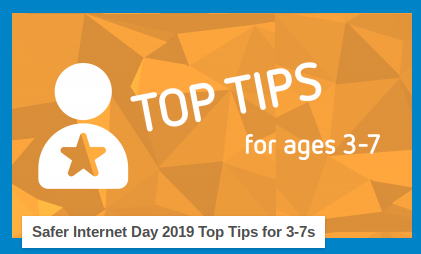 Safer Internet Day 2019 will be on Tuesday 5th February and will be celebrated globally with the theme: Together for a better internet. 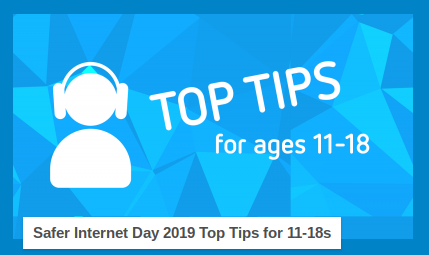 The UK Safer Internet Centre has launched top tips and advice pages especially for Safer Internet Day 2019. These tips, advice and resources are to help young people and their families enjoy technology and the internet together in a safe and positive way. These top tips are about staying safe online as well as the ways young people can ask, give, and receive permission online. For more details on the tips click on the image below. The top tips for 3-7-year-olds centre around asking if something is okay online, as well as looking at personal information and where young people can go if they need help. 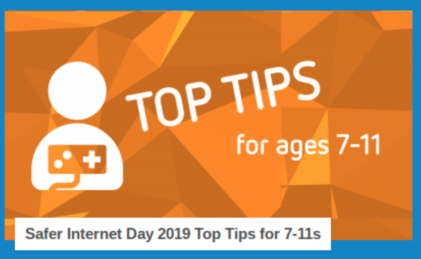 The top tips for 7-11s look at sensible choices online, choosing whether something is okay online and ways that young people can be role models. The top tips for 11-18s look at how everyone can play a part in making the internet a better place, including by being supportive and positive and talking to someone if young people are not sure how to respond to something that happens online. 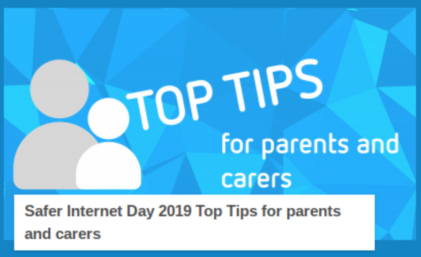 The top tips for parents and carers give advice and guidance on how to support children and young people online. These tips are a great way to ensure that parents and carers are supporting their children and giving them the tools to stay safe and positive online. They highlight ways to have a conversation, take a balanced approach and to make use of the tools available. SafterInternetDay.org have also released a new video for parents and carers where young people look at how it makes them feel when something is posted without their consent. Education Packs, which are tailored made for 3-7s, 7-11s, 11-14s, 14-18s and parents and carers, along with some guidance for educators. Available in English and Welsh these free packs include lesson plans, posters, presentations, activities and more! Our Safer Internet Day TV 2019 films have been produced to complement the Safer Internet Day Education Packs. The films act as an extension of the packs and as such aim to be conversation starters around the topic of consent in a digital world.